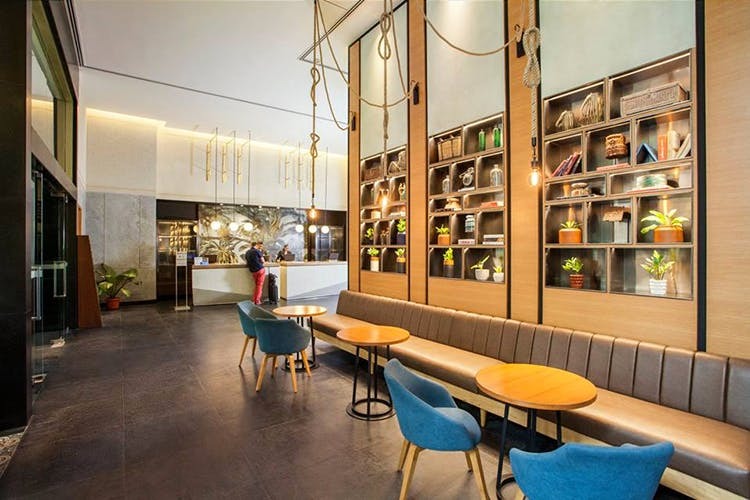 The newly revamped Hyatt Centric MG Road Bangalore is a hotel that wants you to engage with the city, and for a change, not just stay in the hotel all day long. But with a pool like there’s we say spend a little time in-house! Remember Ista? Or the last Hyatt? Well, take all your remember and erase those memories, as the new Hyatt Centric on MG Road, is a cool new place for all you business folk who need to check in guests, and give them a taste of Bangalore. Apart from the prime location, our first impressions of this place were that is it welcoming, casual and has a great cafe, as soon as you entre! Yup, you can take a few pastries, a coffee and head up to your room, or perhaps on your way out, make it a grab and go. Rooms are another reason we recommend this hotel. Before you roll your eyes, and say, “Obviously!”, we mean more than the beds and pillows being good. Each room has a touch of Bangalore — the one we were in had a bright yellow and black auto rickshaw painted on it. In fact, this hyperlocal themes runs through the hotel in the decor, coffee table books and the way the staff will guide you when you want to step out of the doors too. But back to the rooms. Attention to detail is another draw. Each space has plants that gives out oxygen at night too, keeping your room fresh and green. Plus, with local artistry in the form of hand-painted bedside tables and views of the city or the pool, you can easily make it home for a long time. That said though, the hotel encourages you to step out – an interesting change from most hotels that want you to stay in. From packing you off on historical explorations, shopping escapades and even tying up with restaurants to sample local food, they’re all about promoting our gorgeous city. For those interested in staying in, and despite the hotels aims, we do think you should, they have a coffee shop called the Bengaluru Brasserie. With a fusion twist to Indian, European and Asian food, you can happily feast on a meal by the gorgeous pool. We do love ourselves a dip in the pool — a rooftop one no less! Set in an urban garden, the infinity pool is ideal to watch the sun set over the city centre. Add on a wine or beer, and you’ve got a perfect end to your work day! We plan to check in on the next weekend for a staycation. Just don’t tell anyone we’re actually in town, please?